Peter Anderson read the following story at The Parlor’s 2nd Annual Emerging Writer’s Festival. Look for the podcast soon at theparlorreads.com. In the meantime, check out Mr. Anderson’s site for more of his work. Had Harold Lee Avery not died suddenly in April 1937, his weakened heart falling victim to too many years of rich meals, the knowledge of how his only son ended up after graduating from Elmhurst Prep would surely have killed him anyway. This would, one day, become the oft-repeated and bitterly heartfelt claim of Millicent Avery, wife of Harold Lee and mother of young Harold. Such statements of disapproval and disappointment had become so common, so routine and familiar, that Harold barely heard them any longer. This afternoon she was voicing some similar lament, but Harold barely listened as the two sat far apart, across the broad distance of the Packard’s rear seat, looking away from each other at differing street scenes outside. He didn’t hear her specific words, but soberly grasped her meaning, which rarely varied. He merely grunted in reply while continuing to stare out the window, as the Packard made its smooth and leisurely pace along the tree-shaded and broad-lawned avenues of Magnolia Park, the finest neighborhood in Atlanta. Millicent Avery always said she wanted only the best for her son, her only child, perhaps even more so than her husband had. After the latter’s sudden death Millicent became the diligent caretaker of young Harold’s future, intent on fulfilling all of the arrangements Harold Lee had made for his son. Four years at William & Mary and two years at Yale Law—the father’s alma maters—and then an apprenticeship at Avery Fordham & Stearns, Attorneys at Law. A stellar early career as an attorney would be followed by a judgeship, both of which Harold Lee had himself attained, and then the United States Senate, a position to which Harold Lee had always aspired but ruefully never achieved. Harold Lee—his middle name willfully given in tribute to the Confederate general, in proud defiance of Reconstruction—had been a quietly powerful and imperious man, scion of one of Atlanta’s oldest families. For decades he methodically controlled the lives of scores of people around him, family and friends and colleagues alike, moving them around like pawns on a chess board, their every movement known to him in advance precisely as he had plotted out, each one serving his various needs and desires. He had every reason to believe it would be no different with Harold, his own son. For Harold Lee saw in Harold the perpetuation of the Avery family destiny, one of greatness and of relentless ascension. As did Millicent. The car rolled to a stop, driveway gravel crunching beneath the whitewalled tires. The right-side door promptly opened and Millicent briskly but elegantly stepped out. Harold heard a muffled but clearly subservient greeting, and saw a white-gloved hand resting politely atop the door frame, before he turned back to his own window. Harold exhaled with irritation, then slid across the seat and climbed out. As Millicent gazed at her son he looked away, taking in the massive expanse of house before him. Two and a half stories with wings on each end and a broad veranda in front, with classic Atlanta red brick and freshly-painted white shutters, the surrounding grounds lushly and impeccably landscaped. Magnificent, even Harold had to admit to himself. Despite Harold Lee Avery’s diligent efforts, none of his beliefs or ambitions were ever successfully instilled in the young man. Harold was eased into elite private schools, where despite middling grades he was continually promoted upward as a favor to his father and his charitable largesse, and introduced into the loftiest and best social circles. But despite his father’s well-intentioned prodding, the young man showed little interest in advancing academically or gaining the right friends. Harold instead kept to himself and was rarely away from the family house, where he was usually found with his nose in a book—in his father’s estimation, nothing but middling, populist tripe such as Dickens or Wilkie Collins—or otherwise idling with a menagerie of mongrel animals which he kept in an unused wing of the coach house. It was just such simple and unambitious pursuits—reading popular literature, tending to cats and dogs and rabbits and a belligerent goose, or just being alone—which occupied Harold’s thoughts as he hesitated before the Wendell Hutchinson house. Pursuits which he longed to returned to, and might have done so were it not for his mother’s insistent pulling-forward. Very well. He would do this for her, and for his father, and be done with it. Tonight, for a few more hours, he would observe and respect the formalities of refined society, the norms which his parents so revered. He would do so again, likely for the very last time. He gathered himself and followed his mother through the house’s arched front doorway, their shoes tap-tapping across the marble floor, to the receiving line which awaited on the opposite side of the portrait-lined foyer. “Harold, how good to see you,” Mrs. Hutchinson said, with only the slightest suggestion of warmth. To Harold she seemed matronly, almost an old woman, even though she was the mother of his classmate, Emily, and couldn’t have been much older than his own mother. He nodded, purely out of polite habit, without a word, and shook her pallid hand. It occurred to Harold that Mrs. Hutchinson could have asked his mother—then already past the receiving line and moving toward the ballroom—that very question herself, just seconds earlier. But he remembered that the woman was a notorious gossip, one presumably more interested in what other people thought of someone else rather than how that person actually was. “She’s holding up well, thank you,” Harold replied, hurriedly, having quickly realized that his silent musing had caused a delayed response which might be construed as rudeness. Although being rude didn’t particularly bother him, he wanted to be finished with this evening, and the entire weekend, with a minimum of repercussions from his mother. As tempting as it might be, he thought it best not to offend her society friends. He nodded at her, gesturing his farewell in silence, and continued toward the ballroom, in his mother’s blustering wake. Oh, she’s holding up just fine, he had wanted to reply. She’s overcoming her grief by keeping Harold Lee alive through me, never mind what I might want for myself. But he refrained from saying so, as satisfying as it might have felt. He moved with his mother through the milling throng, keeping just behind her, remaining on the distant fringes of her chattering conversations. There, but not entirely so. Everyone who struck up conversation with Harold began with some variant on the same words—”Sorry to hear about your father”—followed by subdued commiserations about Harold Lee’s fine character, inquiries about his mother’s well-being, and offers of whatever assistance might be needed, before Harold’s subdued responses would send them along to another circle and a more inviting conversation. After an hour had passed, Harold realized that no one—not one single person—had asked about him, how he was feeling, what he had been doing lately, what his plans were for after graduation. A few more well-wishers came and went as Harold went through the motions of polite discourse while darkly considering his newfound insight. Do any of these people really know me? he thought, his frustration rising. Am I anything to them other than the son of Harold Lee Avery? The answer, suddenly so obvious to him, came painfully, and with gritted teeth he readied himself to break free, to escape the crowd and its superficialities. He was about to set aside his empty punch cup and move toward the exit when he felt a finger gently tap his shoulder. He turned to see the smiling face of Emily Hutchinson and, just beyond at the edge of his vision, his mother looking on, beaming with approval. “Ask a girl to dance?” Emily said, grinning. “Of course he’ll dance, Emily dear,” his mother interjected, projecting her voice into the midst of their conversation. “Come on, Harold, it’s the waltz!” Emily gently prodded. He sighed and nodded, allowing Emily to lead him by the hand to the dance floor. He would submit to this formality, not for Emily—who had always been kind to him—and certainly not for his mother, but to fulfill his obligation. To dance, and particularly to waltz, was such a deeply ingrained custom in such society that his refusal might bring about a minor scandal. Or perhaps he would do this partly for Emily, after all. Besides being kind to him, she was quite fetching—Easy on the eyes, his father might have said in one of his rare relaxed moments—and particularly so this evening. He might easily have been attracted to her, but had always sensed some emotional distance between them. They began their waltz, stuttering to a start as Harold remembered only at the last moment to take the lead. He had never learn to dance properly. The activity seemed pointless to him—rigid couples flitting about in perfect but soulless circles, making only the lightest and emptiest of conversation—and his disinterest prevented him from mastering even the most basic steps. Which, when added to his lack of physical grace, always resulted in a generally sorry performance on the polished parquet floors of Atlanta’s great houses, on those few occasions he had been enticed onto them. But he would give it one last chance. If nothing else, he would show once and for all that he didn’t belong here. As they moved about the floor—Emily lithe but Harold hopelessly stiff—she chatted, slowly drawing him out, showing interest in him which, while mild, was still greater than that shown by all of the other partygoers. “Yes, my father certainly had influence,” Harold grimly replied. It was true. He wasn’t excited about any of it, and he would no longer pretend otherwise. Within a few minutes he would leave the Hutchinsons’ party, far earlier than his mother would have preferred, offering curt goodbyes to just a few people before moving swiftly through the arched doorway, down the spotless front steps and into the street for the long walk home, to his books and his animals and his solitude. The graduation ceremony at Elmhurst Prep was every bit as grand as expected, the sons and daughters of the city’s elite impeccably dressed and lavishly adorned, quietly glowing in anticipation of the glorious futures ahead of them. Harold, by contrast, sat stiffly throughout the ceremony, his face serious and his thoughts clearly elsewhere. Millicent accompanied Harold home from the ceremony, the two of them stepping out of the Packard while the colored chauffeur held open the door. She had just opened her mouth to speak—brief, perfunctory congratulations prefacing another reaffirmation of the grand scheme for his future—when he interrupted her line of thought before it could once again be put into words. “I’m not going to William & Mary, Mother,” he said quietly before he had even removed the mortarboard from his head. He didn’t look at her as he spoke, instead walking away from her, past the paneled oak front door and the stiffly silent butler. She didn’t follow him immediately, instead stopping in silent shock just outside the doorway. Her jaw dropped slightly before she composed herself and hurried after him. He said nothing, looking away. She was silent as she considered his words, stunned, her quiet anger soon replaced by sadness. But he ignored her weakened state, her vulnerability, as he found himself unable to resist continuing. He walked away and ascended the staircase which curved upward toward the shadowed ceiling, never looking back at her, and moved toward the bedroom which would be his for only a short time longer. Despite the familiarity with which Goodman greeted him, Hal hadn’t made any close new friends in the Corps, merely a few friendly acquaintances. Though he was on good terms with nearly everyone he met, he keep enough distance to reveal little about himself—about his upbringing, his legacy, and the opportunity he left behind to come to the dusty desolation of West Texas. His colleagues liked him for what he was—a quiet, decent, hard-working young man—and not for what he could do for them. It was something his mother would never have understood. He knew a few things about Goodman, much more than he would ever allow to be known about himself. Goodman was from Brooklyn, working class, father deceased and mother still alive but endlessly worrying about him, Jewish but not practicing, garrulous and fearless, funny and casual and relaxed, poor but relentlessly happy. He admired Goodman, seeing in his friend many qualities which he himself longed to possess. Hal’s mother had been right about one thing: he was indeed digging ditches for the Corps. He was stationed at a work camp forty miles east of El Paso, helping to run irrigation pipe from the Rio Grande to a dry valley which, it was hoped, might someday take to cotton farming. A fanciful idea, perhaps, but what most appealed to him about the Corps was its willingness to try anything, to daringly risk failure, in the hope of bringing a better life to those in need. He liked the idea of having his photograph taken, but didn’t think it would look quite right to simply stand and pose. His Corps uniform looked good in person, neat and modest, but he knew enough about the art to realize the uniform might not photograph well, particularly under the harsh Texas sun. He looked around for suitable props but soon realized that the Corps’ humble accommodations might not provide much of visual interest. In harmony with its selfless mission, the Corps’ provisions were sparse, giving him little to choose from. The barracks were austere, to the point of barrenness—a dozen plain cots in each room, each neatly made with a crisp sheet and a thin wool blanket, with a small wooden footlocker underneath in which each volunteer stowed his few belongings. The plywood walls were bare except for a few calendars showing the month of July and pastoral watercolor scenes of country lanes and suburban boulevards. His eyes finally fell upon a frying pan. His mother thought cooking was beneath men of their class; that was the cook’s work, and for the unfortunate lower classes that couldn’t afford a cook it was the wife’s. Yet during his short time in the Corps, he had already learned the simple joy of cooking, for himself and for the others. His mother would never have imagined such a thing. Yes, he thought, the frying pan is perfect. He looked around further, seeing little at first. But at last he spotted his drinking cup, into which he would regularly draw water from the common barrel. His mother wouldn’t approve of sharing water with others, particularly the type of men who worked for the Corps. Nor would his father—a man who refused to share a bottle of bourbon with even a valued client—have approved. Not proper, they both would have said. So the drinking cup was in, as well. He stepped outside, looking for one more prop for the photograph, when across his path ambled an orange-striped tomcat which lived in the camp and reminded him of one he had kept back home. He casually reached down and scooped up the cat, which immediately began purring in the strength of his grasp. 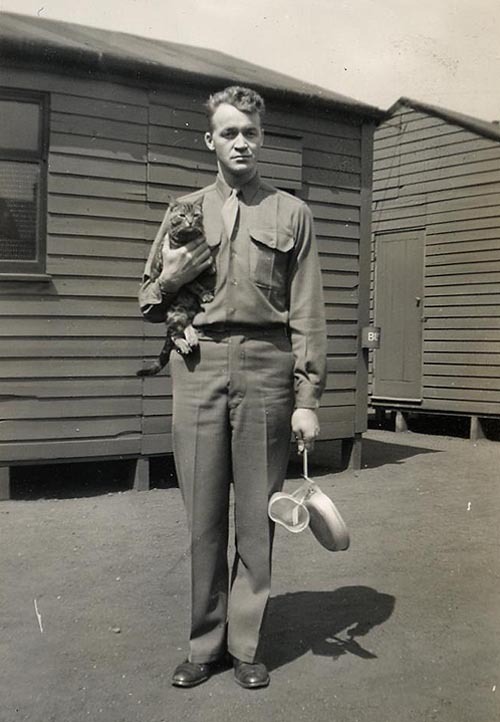 He stood stiffly, facing away from the unpainted barracks wall which stood a dozen feet behind him, the tomcat held under one arm and the frying pan and drinking cup in the opposite hand. He didn’t smile as Goodman released the camera’s shutter, the tomcat looking more amiable than he did himself. Weeks later, Goodman passed him the photograph, gesturing that it was his to keep. Hal looked at it, smiled, and reached down into his footlocker, searching for an envelope. He found one, wrote down the destination address and affixed a postage stamp to the upper right corner. He stared at the photograph for another minute or two, trying to think of the right words, his lips moving almost imperceptibly. Finally he turned the photograph over and wrote out a simple message in elegant script on the reverse side. He read the message once more, just to be certain. Then he rose, sealed the envelope and walked toward the door. The outbound mail would be picked up in just a few minutes.